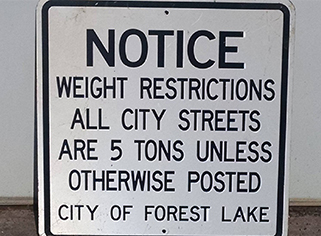 Axle weight limits are restricted on certain streets within the City of Forest Lake to protect these streets from damage when road and weather conditions warrant in accordance with State & City regulations. All City streets will be posted and limited to FIVE TON AXLE per axle weight limit. Residents are encouraged to plan ahead for moving or construction projects during the spring thaw season since weight restrictions will be enforced & large trucks will not be allowed on restricted streets. No exemptions or permits are given during this time period, except for emergency vehicles and utility company service vehicles. The City of Forest Lake only regulates the city streets. All County roads are regulated by Washington County and all Highways are regulated by the State of Minnesota. Private roads are not regulated by the City, but by the homeowners associations or designated responsible party. The City does not maintain any information on contracts for private roads.